On any cake stall there has to be chocolate, and what could be better or easier than this chocolate fridge cake full of dried fruits and ginger biscuits? If it is a hot day, keep the tray cool on a bed of ice or ice packs, and serve slices onto sheets of rice paper to be eaten straight away. Line a 23cm square or 22 x 25cm tray with clingfilm or baking parchment. Place the milk chocolate in a large heatproof bowl with the butter and syrup and allow to melt over a pan of barely simmering water for about 6-7 minutes, taking care not to let the bowl touch the water. Meanwhile, break the biscuits into small pieces with a rolling pin. Stir all the remaining ingredients, except the Smarties and white chocolate, into the melted chocolate mixture until evenly coated. Pour into the prepared tray and level with the back of a spoon. 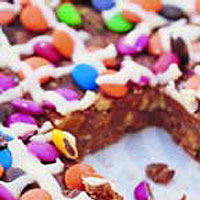 Scatter the Smarties evenly over the top. Melt the white chocolate in a heatproof bowl over a pan of barely simmering water for 4-5 minutes. Then, using a spoon, drizzle or flick the white chocolate over the top of the cake. Chill in the fridge for 3-4 hours, or overnight. Cut into 16 squares using a large sharp knife dipped into hot water. The pieces will keep in the fridge for 3-4 days. Break the biscuits by placing in a clean food bag and crushing with a rolling pin. This recipe was first published in June 2004.